Do you love having an upscale coffeehouse creation every morning, but hate the high price tag? Then whip up your own cappuccinos, lattes, and fancy hot chocolate drinks using an affordable milk frother. You may never buy another expensive coffeehouse drink or whipped cream again. After all, why would you when you can create barista results for a fraction of the price at home? A milk frother is a small kitchen tool that can produce light, airy froth and foam for all of your favorite hot and iced espresso drinks. In just a matter of seconds, hot or cold milk can be transformed into a rich creamy topping on your latte. Frothers can also be used to quickly mix together light ingredients, such as hot chocolate, sauces, powdered drinks, and scrambled eggs. It can also be used for low-fat and non-dairy milks, as well as soy or almond milk. The Ikea Milk Frother is affordable, handheld, battery-powered and will consistently froth milk in only 15 to 20 seconds. You can use it with hot or cold milk and easily wipe it down after use. It is so easy to use, all you need to do is set the frother in the milk and turn it on. It requires two AA batteries, which are not included. At just over $6, the extremely affordable price tag makes this a must-have in every kitchen. 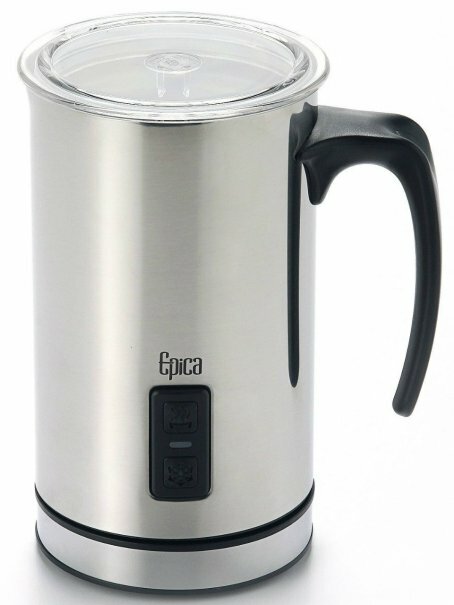 The Epica Automatic Electric Milk Frother and heater carafe with detachable base can stand up to some of the best and most expensive milk frothers on the market. It is equipped with vacuum insulation to help the interior contents consistently maintain their temperature (like a thermos). With a heavy-duty motor and three settings, you can choose to create hot froth, cold froth, or hot milk. 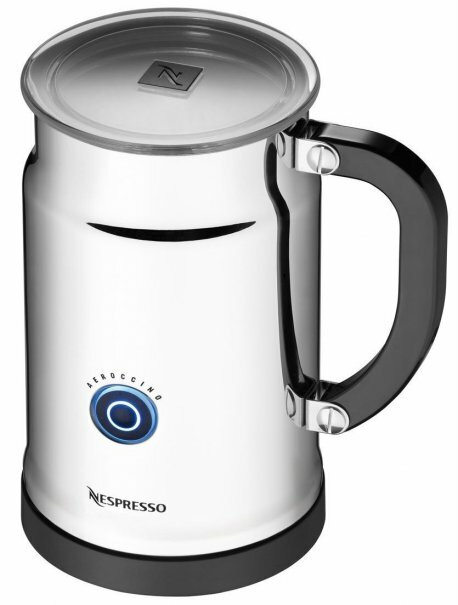 This will allow you to easily and quickly make your latte or hot drink in the same carafe. It can heat about 250 ml of milk at a time and 125 ml for frothing (because the milk will double in size). It is easy to use, easy to clean, and equipped with level indicators to help you pour just the right amount of milk. Along with outstanding customer reviews, you can also take comfort in the two-year warranty. 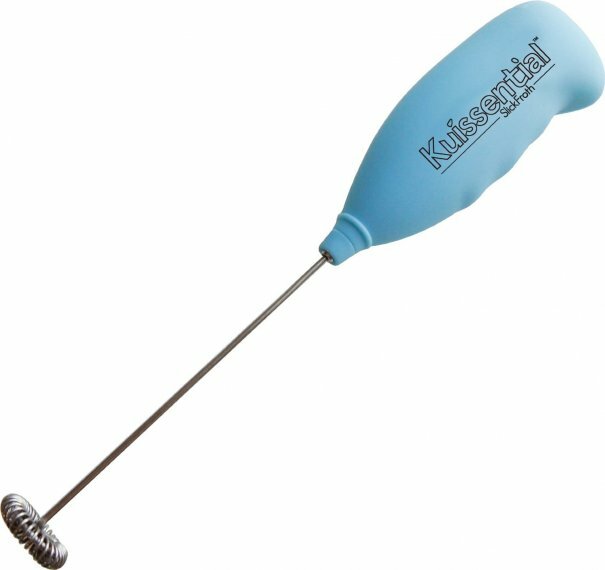 Recognized as the best milk frother by Consumer Search, the Kuissential SlickFroth 2.0 is a handheld, battery operated milk frother that can consistently create foam in a matter of seconds. The lightweight 2.0 version has been improved based on customer feedback, and has been welcome with overwhelmingly positive reviews. It features a stylish handle and durable stainless steel stem and whisking head. It is easy to operate and clean and requires two AA batteries, which are not included. The petite Ozeri Milk Frother is perfect for steam-free cappuccinos, lattes, espressos, hot chocolates, shakes, frappes, and other drinks. It activates instantly and foams all kinds of milk (such as whole/regular/skim milk, soy milk, almond milk and coconut milk) for fluffy hot lattes or cold malts in seconds. The powerful tool can whip up thick foam in as little as 10 seconds using a 15,000 RPM motor. The gleaming stainless steel wand is shaped with contours to comfortably fit in your hand. 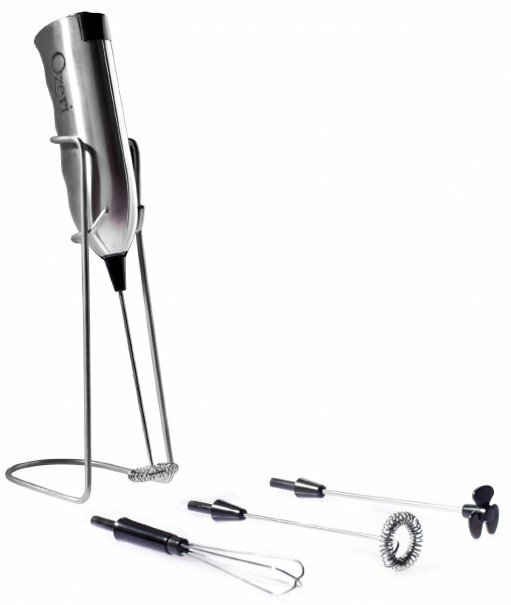 It comes complete with an elegant stand, two milk frothing whisks, an egg beater attachment, and a propeller-shaped attachment, so you can also mix cocktails, eggs, soups, dressings, sauces, and more. It is a compact handheld size, so it can easily be stored away on the stand. Requires 2 AA batteries (which are included). It is also backed by a satisfaction guarantee for your added peace of mind. The Nespresso Aeroccino Plus is a versatile kitchen tool with detachable base can create hot milk for lattes, as well as hot and cold milk froth for cappuccinos. Thick hot milk froth is consistently created in only 70 seconds using this fast, easy machine. It offers maximum capacity 130 ml (for milk froth preparation), 250 ml (for hot milk preparation), and with maximum and minimum low-level indicators, you can easily fill it to the right amount. Cleanup is also a breeze, saving you even more time in the morning. And those are our recommendations for the best milk frothers. As always, be sure to check Wise Bread's Buying Calendar to learn when and how to buy just about anything!